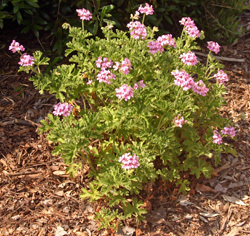 Geraniums are popular bedding plants. The bedding plants gardeners plant out in late spring and bring inside in autumn are commonly known as geraniums; but geraniums they are not. They are pelargoniums. True geraniums are the cranesbills, hardy North American and European herbaceous perennials; while pelargoniums are semi-tender or tender plants, mostly from South Africa, that have graced our gardens with their large flowers for decades. Pelargonium quercifolium flower (L) and leaf (R). To tackle the complex history of geranium or pelargonium, one has to confront the use of common names versus scientific ones. Scientific names give individuals a common language by which they could communicate with other people, no matter the country they are from or what their mother tongue might be. In 1753 the famous and influential Swedish botanist, Linnaeus, published his two-volume book called Species Plantarum, in which he attempted to pull together the names and descriptions of all known plants. He placed all geranium and pelargonium plant species in the genus Geranium. A few years later, the French botanist L’Heritier, noting that some geranium species of plants were so distinct that they should be in a different genus, formally transferred them from Geranium to Pelargonium. Zonal geraniums used as bedding plants. However, for reasons unknown, this change in names was not accepted by all botanists and garden writers. A theory exists that H.C. Andrews, a prolific and popular garden writer and illustrator in the early 1800’s, rejected the name Pelargonium in his book on geraniums, thus firmly attaching the name Geranium to all members of the family including the group of widely grown garden plants – namely the zonal or bedding geranium, correctly known today as Pelargonium x hortorum – thus leaving us with nomenclatural confusion. Perhaps we shouldn’t worry too much about the name. 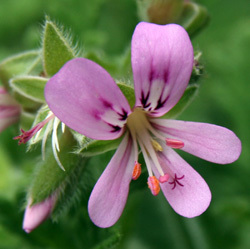 To change the common usage of a long-standing name like geranium is probably an unrealistic goal, so with the addition of some descriptive prefixes – hardy geraniums, zonal geraniums, regal geraniums, or scented geraniums – communication using common names, in this specific case, can be made more precise. For purposes of our discussion, geranium refers to the tender garden plants, while hardy geranium alludes to the cold hardy perennials. Discovered in South Africa, the first geranium plants, Pelargonium triste, quickly gained acceptance in England in the 17th century. A slew of more discoveries followed: fragrant P. cucullatum, one of the ancestors of Regal geraniums, was first collected by the German-born Dutch botanist, Paul Hermann; P. peltatum, the ivy-leaved geranium, introduced to the Netherlands by Willem Adriaan van der Stelin 1700, but not until 1774 to England’s genteel; and finally, the striking flowered P. inquinans and P. zonale, both of which are responsible for the complex hybrids of P. x hortorum, the familiar form of geranium so popular today. But it wasn’t until 1786 when Thomas Jefferson shipped the plant from France to noted Philadelphia horticulturist, John Bartram, that the geranium finally grabbed the attention of gardeners in America. 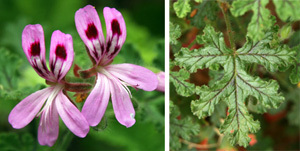 The flowers of different Pelargonium species (L-R): P. betulinum, P. fulgidum, P. hispidum, and P. puchellum. Fascination with these plants continued over the next century, and Robert Sweet’s five-volume book on geraniums, published between 1810 and 1820, became the definitive guide to this delightful plant variety. Geraniums have been so widely crossed by plantsmen over the centuries that the plethora of new breeds has inevitably resulted in the tragic loss of many old cultivars. However, the enthusiasm shown for new discoveries and strains has never faded. Traditionally, plants were grown from cuttings (vegetatively propagated). However, since geraniums are subject to bacterial diseases, and cuttings can transmit such diseases, methods have been developed for propagating geraniums from seed instead of cuttings. In l962, Dr. Richard Craig of Pennsylvania State University in developing a technique for seed scarification (nicking), bred the first commercially successful open-pollinated, seed propagated geranium, ‘Nittany Lion Red’, a bright red geranium with single flowers. Four years later, Dr. Lowell Ewartof Joseph Harris Seed Company developed the first F1 hybrid geranium from seed. These first hybrids, designated as part of the ‘Moreton’ series of geraniums, were ‘Moreton White,’ ‘Scarlet Picotee,’ ‘Red,’ ‘Scarlet’ (‘New Era’) and ‘Deep Salmon.’ Two years later, three colors – ‘Bright Pink,’ ‘Deep Salmon’ and ‘Scarlet’ in the PanAmerican Seed Company’s ‘Carefree’ series went on to win the coveted All-America Selections (AAS) awards. Pelargonium cultivars display at Ball Gardens, IL. And it didn’t stop there. The early blooming ‘Sprinter’ series, the result of a pioneering collaboration between Goldsmith Seeds of the U.S. and Sluis & Groot of the Netherlands, introduced the classy rose-pink ‘Showgirl,’ another AAS Winner. Prior to the 1990’s all hybrids were from diploid geraniums. But in 1991, PanAmerican Seed Company had a major breakthrough in ‘Freckles,’ a tetraploid hybrid, another AAS Winner (l991). Tetraploids have twice the number of chromosomes as diploids and produce huskier plants with thicker stems and bigger flowers. One of the first ivy-leaf geraniums from seed, Summer Showers series from Pan American Seed Co., have attractive emerald-green leaves which provide the perfect backdrop to large, loose clusters of single flowers in gorgeous shades of red, rose, lavender, magenta and near white. Exhibiting a gentle cascading habit and better branching without pinching, they are ideal for hanging baskets and containers. We know dark foliage is “in” – a trend probably begun with the introduction of the dark-leaved coral bells, Heuchera ‘Palace Purple.’ In the geranium family, none is more exciting than the novel 2002 AAS Winner, ‘Black Velvet Rose,’ with solid nearly charcoal, chocolate-brown leaves enhanced with only a narrow strip of green which contrasts nicely with the bright-rose blooms. Geraniums are a promiscuous clan, cultivars number in the thousands – but so few standouts. The number one thing gardeners want is not another red geranium, but a plant they can count on. In vegetative breeding, one such revolutionary breakthrough, bringing together the best features of ivy and zonal geraniums established a new geranium class, Pelargonium hortorum-interspecific. Two exceptional series from Syngenta – the Calliope and Caliente – offer vivid flower colors, tremendous branching characteristics and vastly improved disease resistance. 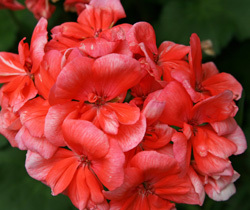 The excellent performing Caliente series (‘Coral,’ ‘Deep Red,’ 2005) look and behave more like ivy geraniums. Subsequent jaw-dropping introductions, ‘Hot Coral,’ ‘Pink’ and the best of the best, ‘Orange,’ 2010, are naturally early flowering with large shatter-resistant flowers, dense, mounding plants exhibiting extreme heat-tolerance, thus giving gardeners reliable plants with a continuous supply of carefree glowing color all summer long, even under extreme weather conditions. While most ivy-zonal crosses look more like ivies, the Calliope series leans toward its zonal parentage. First introduced in 2008, the robust flowering ‘Calliope Dark Red’ really stands out. Covered with intense, semi-double, dark-red flowers, it is the true dark-red of the ivies, unmatched by any zonal plant. With the addition of ‘Scarlet Fire’ in 2009, these plants excel as expressive additions around patios and porches. Grandiosa Regals is Dummen’s new geranium interspecific series in a cross between three geranium species (pelargonium x domesticum x crispum). Although the flowers look like Regal geraniums the plants act like zonals, representing a new benchmark in one of the showiest spring bloomers. 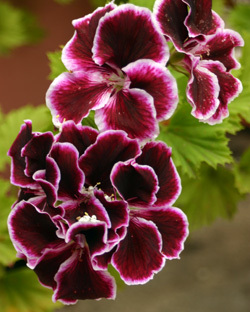 Available in five colors, the relatively small Grandiosa geraniums break from the Regal tradition by flowering throughout the hottest of summers. An introduction from Ball FloraPlant, the Candy Flowers® Series of Regal geraniums (Pelargonium x domesticum), feature medium-sized flowers in a impressive array of bright colors and beautiful patterns. These beauties, Bright Red, Dark Red, Pink with Eye, Violet and Bicolor (2011), are the very showy floosies of the geranium family – truly flamboyant and flashy. They flower early in the season, then, with just a bit of extra care, continue flowering even in the heat of summer providing gardeners a standout display in containers. The large, colorful, semi-double flowered Fantasia® Series of zonal geraniums, also from Ball FloraPlant, show a great deal of heat tolerance. Available in 11 electrifying colors, Strawberry Sizzle, Violet and Purple Sizzle (2010) are the gems, with Violet taking top honors, named ‘Best of Show’ in the 2009 Penn State University trial gardens. For gardeners living in warm climate zones, Fides 2009 introductions in the Master Idols series cannot be beat. Bred specifically for excellent performance in warm conditions, the series of uniform, upright 15-19 inch tall plants in a rainbow of enticing colors – ‘Red,’ ‘Scarlet Red’, ‘Coral,’ ‘Pink,’ ‘Neon Purple’ and ‘White’ – brandish fantastic branching habits, one plant can easily fill out a patio container. The big question here is which of them to choose. There are so many forms and species available today; the best thing to do is choose the plants in bloom. 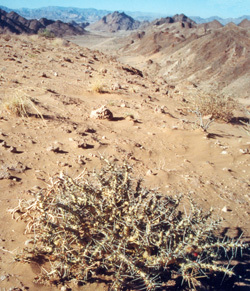 A leafless plant of Sarcocaulon pearsonii (foreground) near Rosh Pinah, Namibia. Both the Pelargonium and the Geranium belong to the family of Geraniaceae, which, thus far, also includes Erodium, Sarcocaulon and Monsonia. Pelargonium, derived from the Greek word pelargos, which means stork, and Geranium, from the Greek word geranos, meaning crane, share the same singular characteristic common to all these genera — the fruit resembling a bird’s beak. Common or Zonal Geraniums (Pelargonium x hortorum) – This is the classic bedding plant, which typically comes to mind when someone says “geranium.” Deriving its name from the “zoned” leaf markings, it thrives both in containers as floriferous single specimens as well as planted out in swaths awash with color in the landscape requiring minimum care, making it one of the most rewarding and versatile plants in the garden. Pelargonium x hortorum mixed with other annuals and perennials. Most commonly available in single- or double-flowered types, the upright, mounding, typically 1– 2 foot tall plants have blossoms that range in an amazing array of color from pristine white, to salmon, pink, orange, magenta, lavender and brilliant red, to numerous flashy variations of bi-colored blossoms. Within this group are “stellars” with thin, spiky star-shaped petals and leaves; unusual tulip-flowered types, cactus-flowered, spotted and speckled bird’s egg and pompon rosebuds of which the white-and-pink bi-colored ‘Appleblossom Rosebud’ is simply bewitching. There are dwarfs (less than 10” tall) like the profusely blooming “deacons,” and miniatures less than 6” tall. Geraniums grown for their fancy leaves (mixed with green and purple sweet potato vine). The only zonals not grown primarily for the blossoms are the fancy-leaved varieties. Nearly every group of geranium cultivars, except for the F1 hybrids, includes a few with variegated foliage. Developed in Victorian times, when stylized flowerbeds and symmetrical forms of garden design were in vogue, fancy-leaved geraniums produce leaves in shades varying from very pale, yellowish green to dark green to a dark band containing reddish pigment. The differences in the extent that the three colors overlap create a plethora of plants all with different patterns of colored leaves. Regal and Angel Geraniums (Pelargonium domesticum) – The Regals, which are also known as Martha Washington geraniums, are bushy plants with large blossoms, single or double flowers in dramatic colors and patterns. Regals tend to be spring blooming, requiring cool nighttime temperatures to bud. Angels are smaller versions of Regals developed for their dazzling blooms which look somewhat like pansies. Scented-Leaf Geranium (Pelargonium domesticum) – Scented-leaf geraniums are coveted heirloom plants, still grown today for their pleasing fragrance, unusual foliage, delicate flowers, essential oil and culinary use. The scent, created by oils in the leaves, is released when the leaves are rubbed or bruised. The fragrance of a scented-leaf geranium may remind you of roses, lemons, cloves, nutmeg, pine, peppermint, apple, pineapple, chocolate, coconut and all kinds of other virtually indescribably spicy fragrances. Ivy-Leaf Geranium (Pelargonium peltatum) – Plants with long, brittle stems full of sculptured, ivy shaped leaves and gracefully trailing habits, they are immensely popular for hanging baskets, window-boxes and containers. Flowering abundantly throughout the summer, they have smaller, looser flower umbels of single, semi-double or double blossoms in shades of deep maroon, red or pink. 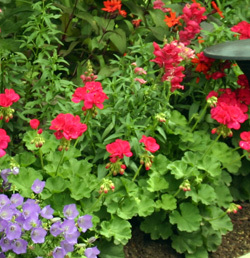 Geraniums have a proven record as popular bedding plants. Traditionally, they were grown from cuttings; however, in recent years seed-grown hybrid geraniums have become popular with gardeners. Yes, seed for an F1 hybrid single flowered zonal is a bit more expensive, but you are guaranteed reliability. They possess excellent vigor, heat tolerance, disease resistance and are free blooming. 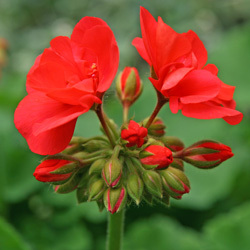 Geraniums are easy to grow from seed, but they are rather slow growing. Sow seeds indoors eight to ten weeks prior to the last average frost date in your area, or from the date when you’d be setting out other warm-weather annuals. Flowering generally occurs 12 to 16 weeks after sowing. Fill clean individual pots, flats or shallow containers having good drainage with a thoroughly moistened, sterile seed-starting mix to within a half-inch of the top. Tamp the mix gently. Sow one or two seeds per pot or cell if using flats. 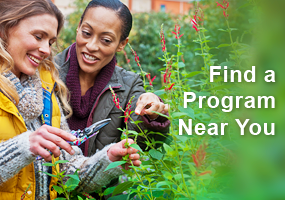 Sow seed in rows 2 to 3 inches apart and cover with about l/8 inch of the medium. Mist the mix with enough water to moisten it thoroughly. Label, cover with a sheet of clear plastic or place in a plastic bag and tie it shut with a twist tie to insure a uniform moisture level during the germination period. Set the container in a warm location, out of bright light, keeping the growing medium between 70° and 75°F (21° – 24°C) by placing it on a heating mat or warm surface. Seedlings usually emerge in one to two weeks. Remove the plastic covering and keep the mix evenly moist – but not soggy – by watering from the bottom. When the tiny plants have 3 or 4 leaves, transplant them into cell packs or individual 2 ¼-inch or larger pots. Seedlings growing in individual pots or cells need only thinning. Snip the weakest seedling with scissors so that only the strongest-looking one remains. Grow seedlings under fluorescent lights with the lights on for 12 to 14 hours, or in a south facing window with direct, unobstructed sunlight. Water thoroughly when the soil surface is dry to the touch and fertilize weekly with a one-quarter strength houseplant fertilizer. Pinch tips to encourage branching. 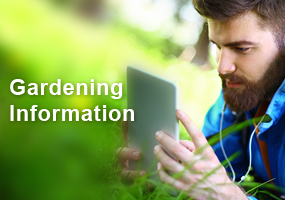 Harden the plants outdoors and plant when the danger of frost has passed. 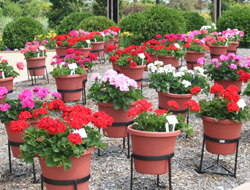 Selection of horticultural geraniums for sale. flowers that are just opening, so that you can see the color of the blossoms. 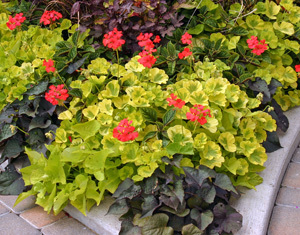 Ivy geraniums are naturals for hanging baskets and window boxes. Flowers borne in small clusters come in a range of colors from the subtle white and mauve to the strident shades of pink and red. A riot of color in the spring, they continue the show through summer into fall. 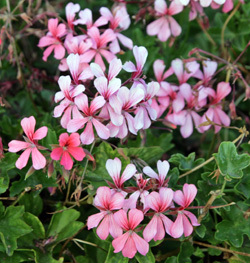 Exemplary in a mass of single color plantings, they also sparkle mixed with other trailing plants – such as pink-flowered ivy geraniums inter-planted with blue or white trailing lobelia. Geraniums are popular garden plants because of their long-lasting flower displays, even under adverse weather conditions. Plants currently available are seed grown, providing a longer display of color that lasts well into fall. They look good in a bed all by themselves, mixed-in with other annuals, or wherever there is a need for a splash of vibrant color. 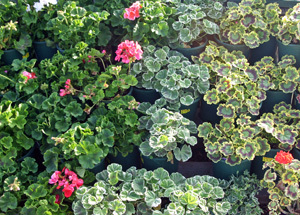 Warm weather plants, geraniums should not be planted outdoors until all danger of frost is past and the soil has warmed. For maximum bloom, plant them where they’ll get at least 4 to 6 hours of direct sunlight daily and space the plants 8 – 12 inches apart. 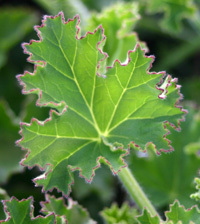 Geraniums need good air circulation, but should be protected from strong winds which can break their brittle branches. Geraniums should be planted in moisture retentive, but well drained good garden soils, at the same level as they were growing in pots. Mulch, where possible to reduce soil temperature extremes and weed growth. Promptly deadhead spent flowering stems to promote additional flowering. Pinch stems to prevent legginess and promote bushiness. They are heavy feeders. For best results, mix a granular fertilizer (5-10-5) in the soil before planting, switching to a balanced, water-soluble (10-10-10) one, to be applied every 4 to 6 weeks during the growing season. A pale pink geranium in a container with other annuals. Popular mainstays for containers, hanging baskets and window boxes, geraniums are well-behaved, low-maintenance, high-performance, sultry garden divas. They mix beautifully with annuals such as lobelia, vinca vine, petunias and verbena, making them attractive additions on decks, patios, porches and balconies. 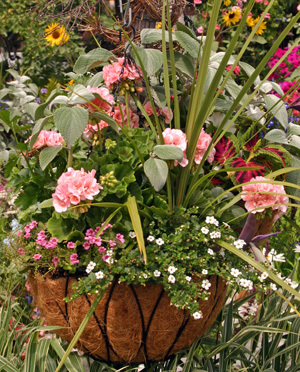 Container: Use a container with drainage holes to prevent soggy soil, which can cause root rot. Soil: A good quality soil-less potting mix (not dirt). Water: Water thoroughly, allow to dry out before watering again. Do not use a saucer under the container unless filled with pebbles. 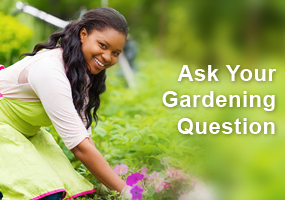 Fertilizer: Fertilize every 2 weeks with a balanced water-soluble fertilizer at half strength. Propagation: Unless you treat your plants as annuals, take stem cuttings in early summer and root in fresh potting mix. A flower of Pelargonium graveolens. Geraniums are not particularly prone to pests or diseases, but they can fall prey to fungal and bacterial attacks, so it is important to know what to look for. 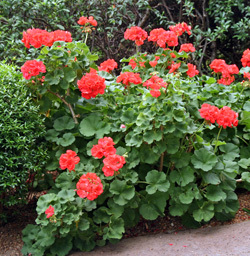 Zonal geraniums can be tricky to grow well in hot, humid summer climates with periodic hard rainfall. Poorly drained soils inevitably lead to stem and root rots. Plants are susceptible to the fast-acting, airborne fungal disease known as botrytis blight, causing grayish-brown, fuzzy masses of fungal spores which eventually turn mushy. Though attacks on blossoms are most prevalent, it can infect any plant part. Earbud caterpillars may chew holes in buds and blossoms. Xanthomonas hortorum pv. pelargonii (syn. Xanthomonas campestris pv. 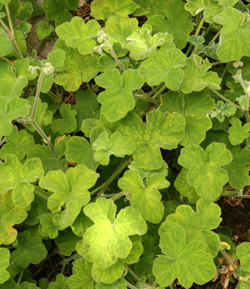 pelargonii) is a widespread and damaging pathogen of zonal, regal and ivy-leaved geraniums. 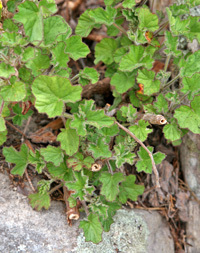 Spread by infected plants and contaminated tools, it attacks the vascular system, so that the plant – whole or in part – wilts in the heat of the sun. An early symptom is leaf spot. There is no cure; the only treatment is to dispose of the plant in the trash. On indoor plants, monitor for whiteflies and aphids. 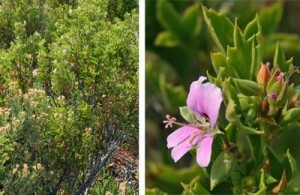 Few plants offer such variation in flower color, growth habit, leaf pattern, and scent. Lush growing geraniums, popular mainstays in containers for indoor and outdoor culture, also thrive in borders and beds by themselves, or mixed in with other annuals. In fact, these versatile plants are perfect for any spot that calls for a splash of sparkling color throughout the season. 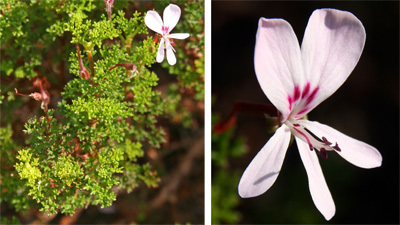 Pelargonium scabrum plant (L) and flower (R). Pelargonium fruticosum plant (L) and flower (R). You can grow Geraniums from seed but it is a slow process. Flowers generally appear 12-16 weeks after sowing. 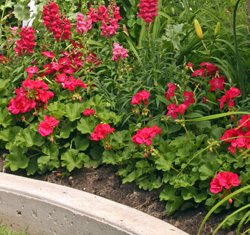 Geraniums are popular bedding plants because of their long lasting flower display. They look good by themselves or with other flowers. Promptly deadhead spent flowers to promote more flowering.